LYNX Technik AG’s yellobrik signal processing solutions were used in the largest signal distribution project in Brazil to date for the Pope's recent mass at World Youth Day. Pope Francis' final mass during his visit to Brazil drew three million people to the Rio de Janeiro Copacabana beach for World Youth Day on Sunday, July 28, 2013. This historic trip was one of the biggest turnouts for a papal mass in recent history. Infoview, Rio de Janeiro's largest rental & staging company, was tasked with outfitting and managing a sophisticated AV infrastructure for this live event. One of their key challenges was to manage the video and audio delays, as well as audio embedding and de-embedding from the front of house (FOH) stage to the 16 public viewing LED towers along the length of the beach. Infoview designed and built a complete video delay and AV signal monitoring system and opted for LYNX Technik yellobrik's to support the solution. Infoview utilized yellobrik CDH1813 SDI to HDMI converters for transmitting and receiving signals from the stage front of house. All signals were then routed and delayed to each of the 16 viewing towers along the beach. The yellobrik CDH1813 units were used to convert SDI inputs into HDMI for monitoring of the signals. These units provided Infoview with the ability to accurately monitor all SDI signals from the front of house stage on an HDMI output. The audio overlay feature ensured that Infoview could also monitor all embedded audio. These yellobrik's were outfitted with the OH-TR-1 fiber optic transceiver SFP modules, which added fiber SDI I/O capability for transmitting the SDI signals up to 10 Km. 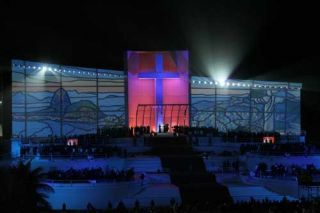 One of the grand ceremonies during World Youth Day was the Via Crucis, a solemn re-enactment of Christ's crucifixion. For this ceremony, Infoview used the yellobrik PDM 1383 analog audio embedder to embed four analog audio signals from the front of house stage and deliver them to the Via Crucis production where additional PDM 1383 units de-embedded the analog audio channels. These units supported the audio / video delay process to ensure accurate AV syncing across each and every viewing tower. These yellobrik embedders / de-embedders were also outfitted with the OH-TR-1 fiber optic transceiver SFP modules, which added fiber SDI I/O capability for embedding and de-embedding the audio signals up to 10 Km.